Display your favorite live plants like never before with this beautiful plant container. The rippling waves that decorate the exterior of this flower pot add a touch of the abstract to your home's decor, and the interior of this plant pot is the perfect size to house smaller plants like succulents, cacti, or various herbs for a splash of vibrant garden greenery anywhere in your home. Bring a touch of unique and eye-catching modern design to your home with this gorgeous ceramic planter. Approximate Dimensions (in inches): 4.75 H X 5.75 Diameter. 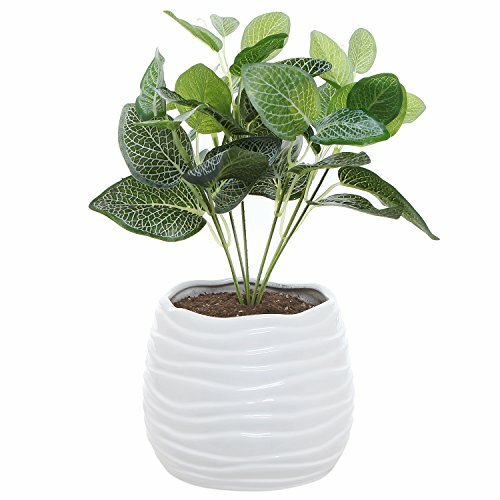 A modern and elegant ceramic plant pot with a white finish and an abstract, wavy design. The rounded interior can be used to house small potted plants - like herbs, succulents, or cacti - as well as other decorative items of your choice. Perfect for displaying on windowsills, patios, coffee tables, and more.